KBShimmer Men Are From Mars-ala | Light Your Nails! Today I’ll show you an indie I am thankful for. This is KBShimmer Men Are From Mars-ala and it’s been a major lemming since it was released. My friend and nail buddy D. got it as an early birthday present for me and I am super thankful for it! Unfortunately I must also say it didn’t meet up my expectations. Don’t get me wrong, formula is great, it’s very easy to paint and it lasted 4 good days without a top coat. I guess I either pictured it different in my mind or it probably looks not too good on my skin tone, fact is I didn’t fall in love with it. Ieri in USA si festeggiava il giorno del Ringraziamento, e per restare in tema vi faccio vedere uno smalto indie che è in mio possesso solo grazie alla mia smaltamica D. che me l’ha regalato per il mio compleanno. Quindi grazie D. per il KBShimmer Men Are From Mars-ala! Purtroppo devo anche dire che non si è rivelato all’altezza delle mie aspettative. Non che abbia difetti, anzi, la qualità è fantastica, si stende come burro e mi è durato 4 giorni buoni senza top coat. Probabilmente l’ho talmente mitizzato che mi aspettavo ancora di più, o forse più semplicemente non sta bene con la mia carnagione. Fatto sta che non me ne sono innamorata come credevo. I am still very thankful for a killed lemming and for my friend D.! Thanks so much buddy! Do you like KBShimmer Men Are From Mars-ala? And is there a special nail polish you are thankful for? 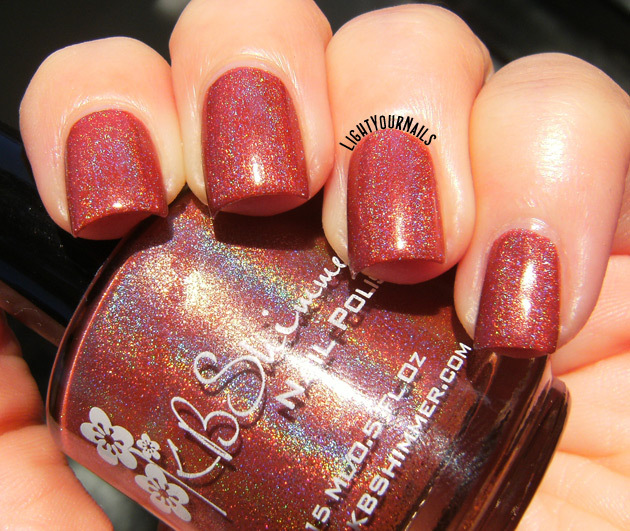 A voi piace questo KBShimmer Men Are From Mars-ala? E avete uno smalto per cui dovete ringraziare qualcuno in particolare? Mi sa che mi arrendo da quel punto di vista, credo che non sia un colore adatto alla mia carnagione! I'm so sorry it wasn't quite what you expected! I always hate it when that happens after a long lemming :( I have to say I think it does look really pretty on you though, I really like the look of ths polish! Thank you so much Ith! Il colore lo trovo grazioso, poi vabbè.... a me basta che mi diate delle particelle olografiche e sono felice! Bisogna che conoscano bene i tuoi gusti però! I haven't picked this one up yet, but I hate when you really want a polish & it just doesn't end up the way you wanted for whatever reason. Yes! I still love this color! I forgot about it but you made me fall in love, again! I've wanted it since its release! I keep seeing this and I feel I need it every time, and for some reason I still don't have it yet. Who knows what my issue is. Oh how I hate when you have had a lemming and it doesn't become the favorite you have longed for. 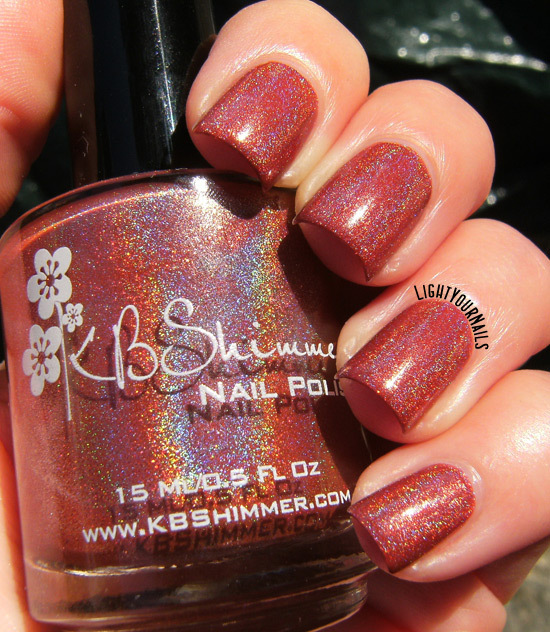 Yess this is one of my favorite KB Shimmer polishes! It's so pretty and has so much holo sparkle. Oh yes, the holo sparkle is gorgeous! So sad for you it didn't meet your expectations :( I still think it looks great! Thank you for your comment. Sorry I don't accept links. that color is beautiful on you. Davvero un portento in quanto a holo effect! Non mi convince molto il colore, che è direi unico ma non me lo vedrei bene addosso. Su di te non mi dispiace! Thank you for taking the time to visit my blog! Please feel welcome to leave a comment, it would make my day! If you have a blog in your profile I will come visit you soon, but please do not leave links. Grazie per aver visitato il mio blog. Sappiate che un commento fa sempre piacere :) Per favore non lasciate link, se avete un blog nel vostro profilo lo visiterò al più presto! All content on this blog is licensed under a Creative Commons Attribution - NonCommercial - ShareAlike 4.0 International License.